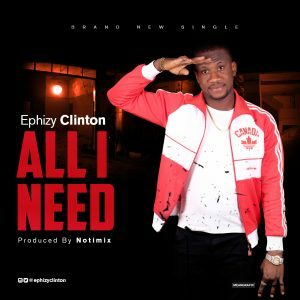 Fast rising music sensation Ephizy Clinton who has given us many hits in the past releases “ALL I NEED” his first single of 2019. This song is one the best songs u can actually hear from an unsigned upcoming artiste and it is also the best song for this Valentine season. The smash hit was produced,mix and mastered by Notimix. You can reach Ephizy Clinton on instagram/ twitter @ephizyclinton.